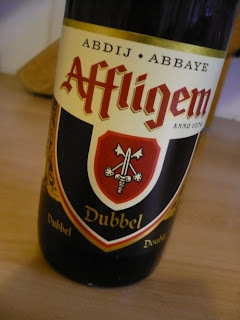 Affligem Dubbel pours a bottle-brown colour and has a fairly thin body. It’s malty and sweet but fizzy. More fumy than you’d expect for 6.8%. Not bad, but not hugely above average either. It’s a bit of a disappointment, really, because I quite liked Affligem Tripel. Wait. Now I am sipping the beer a few minutes after writing the above, and I’m getting more out of this glass. The fizz is greatly reduced, and I sense a biscuit taste and a surprising hint of lavender. Maybe I was just in a rush before and not concentrating. I’m off to Oslo for work tomorrow, and I’ve got one hundred things to do before my morning flight. But OK, time to slow down and enjoy the rest of this abbey beer. I just tried it myself, love it!